This pasta boat recipe is a very straightforward one, but oh so tasty! You just can't go wrong and you will be the star on board! You make this pasta boat recipe in about 40 minutes and it serves 4 to 6 people. 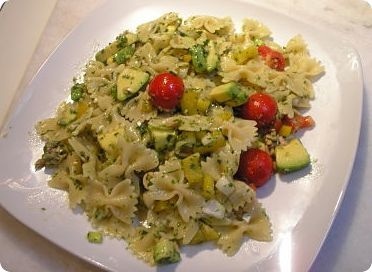 For this pasta boat recipe we have to make a mix from our 3 bunches of herbs. 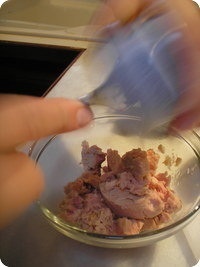 We can do this through a food processor, as shown hereunder, or we can do it manually. If you do it manually, then chop all the herbs in very small pieces and put them in a bowl. Add 4 tablespoons of olive oil and a pinch of salt and mix well. 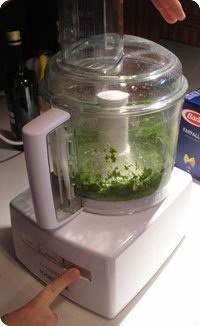 If you use the food processor, then put all your basil, dill and parsley in the processor. Add 4 tablespoons of olive oil and a pinch of salt. Push the button and let the magic happen! When the mix has become smooth, you can stop and put everything in a bowl. Take the 2 spring onions and trim them, so that they look like this. Slice them in half and then in quarters, chop them into little pieces. Take the large pepper and slice the top off. Remove all the seeds and the core and cut the whole pepper in small dice. Now, put the spring onions and the pepper in their own bowl. Cut it in half and twist it open. Remove the stone and cut the halves in half. Peel off the skin and cut everything into small dice. Put the small pieces also in their own bowl. 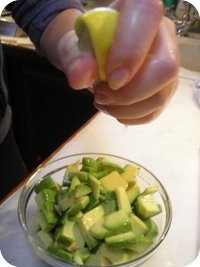 Sprinkle them with lemon juice (or lime juice). This will prevent them to go dark and loose their taste. 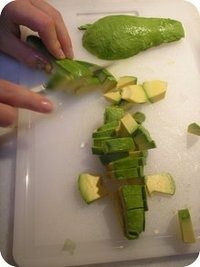 Add the avocado pieces to the bowl with the pepper and spring onions. Open up the tins and get rid of the oil. Crumble the tuna in a small bowl. 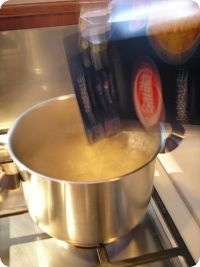 The water should boil by now and we can put the farfalle in the boiling water. The duration depends on whether you're using fresh pasta or out of a bag/box. If the pasta falls apart, you went way too far! When the farfalle is al dente, stop the fire and let the pasta drain well. 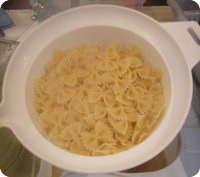 Put the pasta together with the mixed herbs in a large bowl. Have a quick stir through it. 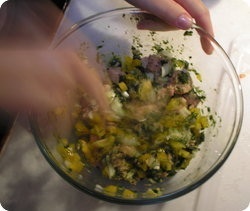 Add the tuna and the pepper-spring onion mix to the bowl of pasta. Toss it around quickly, so that everything is mixed well and then, pour the remaining olive oil on it, together with some salt and pepper. One last stir and you can start to eat this delicious dish as greased lightning!